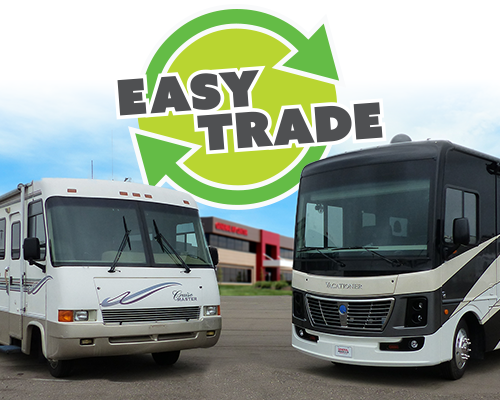 It’s never been easier to upgrade into your next RV than with our EASY TRADE program. This is how smart shoppers buy an RV. Let our RV Experts do the work! We’ll appraise your current RV and help get you the most for your trade. Avoid the hassle and wait of selling online or through a classified ad. Just provide us with the basic information, and we’ll handle the rest. We take care of all paperwork, titles and pay-offs. It’s easy! General RV gives you the most for your trade and your vehicle will never be worth more than it is today. Bring us your motorhome, fifth-wheel, travel trailer, car, truck, van, motorcycle, ATV or boat. We’ll offer you cash towards your next purchase with us. You’ll be in the RV of your dreams in no time. What type of vehicle do you want to trade?